Improper landscape pruning techniques are the most common mistakes in landscape maintenance. Why? 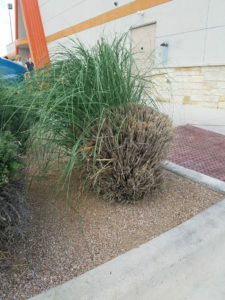 Because landscapers think the plant will come back from dead stems. This may be the case on some plants like Oleanders and Bottlebrush. However, all ornamental grasses need a good trimming almost yearly to induce growth and uniformity. So what does good trimming refer to; 4 to 6 inches from the ground. That’s right, from the ground. The best time for this pruning to occur is in February before the ground warms up and the new foliage begins to emerge. Now, for perennial plants, the trimming is even harsher as some question. Texas A&M recommends pruning all perennial plants yearly 3 to 4 inches from the ground. It may be a shock but with this proper technique, you will rejuvenate your plants with new foliage, encouraging more blooms for spring and summer. So don’t be afraid when you see your Bird of Paradise go from 6 ft tall to 3 inches. You are giving the plant a breath of fresh air to revitalize itself for spring renewal. In addition, the height of the plant is predetermined by their DNA and also the root establishment. If you cut down a 6ft Bird of Paradise, the plant will reestablish itself back to its original size. If you need assistance in handling your landscape maintenance and proper landscape pruning techniques, call Liberty Lawn & Landscaping today at 830-629-5296.